Every story starts with a spark. This is a spark of inspiration – the beginning of an idea – from which a story can grow. But sometimes when you look down at a blank piece of paper, inspiration can seem a long way away. So where can you find a story spark? Keeping your eyes – and ears – peeled can help you to find story inspiration. From the places you visit and the people you meet, to newspaper headlines and conversations you overhear on the top deck of the bus: ideas for settings, characters and story plots can be found everywhere. Keep a notebook with you to jot down your ideas whenever inspiration strikes. Fascinating facts can also spark story ideas. That’s what happened to me when I discovered that bananas are radioactive! From this strange scientific fact, I got the idea of a boy who could use the radioactive power of bananas. This story spark eventually became my novel The Many Worlds of Albie Bright, which tells the story of a boy called Albie, who invents an experiment called the Quantum Banana Theory that allows him to travel to parallel universes in search of his mum. A single bolt of lightning contains enough energy to toast 100,000 slices of bread. The average person accidentally eats over 400 bugs a year. A laser beam can get trapped in a waterfall. Snails have thousands of teeth. What story ideas might these facts spark? Get a blank piece of paper and start writing your story! For more story inspiration, download our BBC 500 Words activity sheet. 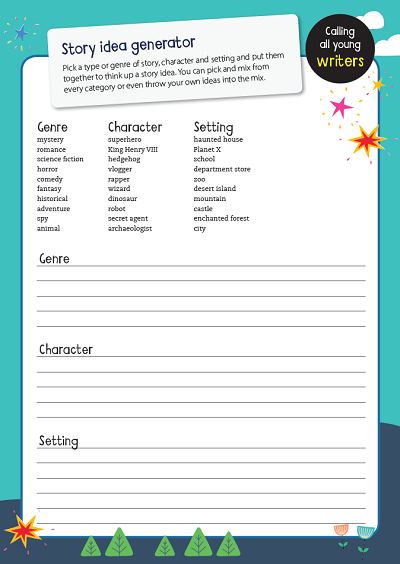 Pick a type or genre of story, character and setting and put them together to make a story idea. You can pick and mix from every category or even throw your own ideas into the mix! 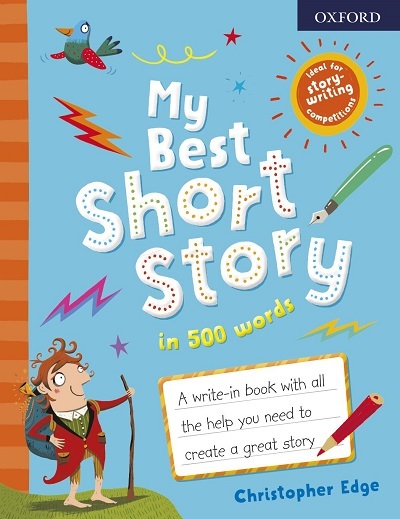 A new must-have write-in book for kids to put down their ideas, set the scene, choose their characters and craft the best short story in 500 words! With colourful illustrations throughout, it has prompts and ideas for building plot, action, characters, scenes, beginnings and endings. Top tips from Oxford word experts are included to further your child’s creativity and writing skills.